Welcome to the Printing Partners Interactive Folding Guide. Use the Pull Down Menu to select the type of fold and paper you are using, the panel size calculator will appear. You must enter the necessary information and click on the “Calculate panel size” button. The height of your piece will not effect the panel sizes. Our folding guide has different specifications for Cover Weight Paper and Text Weight Paper. Please select the correct type of folding calculation for the paper you are working with. If you are unsure what type of paper you are going to print on, it is best to use the Cover Weight calculations. To see an animated demonstration of how the fold goes together, move and hold your mouse over the fold graphic. An Accordian fold can have as many panels as you need. Each panel would be the same size. Calculate the panels, if you know the finished size. To see how an Accordian Fold folds, click the “Play/Pause” button below. A Tri-fold is a piece containing 3-panels per side for a total of 6-panels front and back. Two of the panels are the same size, while the third panel is slightly shorter in width to allow it to fold inside the other two panels. To see how an Tri-Fold folds, click the “Play/Pause” button below. A Z-fold is a piece containing 3-panels per side for a total of 6-panels front and back. All panels are the same size. To see how an Z-Fold folds, click the “Play/Pause” button below. A 3-Panel Gate-fold has 3-panels per side for a total of 6-panels. The center panel is the largest with the outer panels being just slightly less than half of the center panel. To see how a 3-Panel Gatefold folds, click the “Play/Pause” button below. A 4-Panel Double Gate-Fold has 4-panels per side for a total of 8-panels. The two inside panels are the same size while the two on the outside are both one-eigth of an inch smaller. This allows room for the panels to be folded together. To see how a Double Gate Fold folds, click the “Play/Pause” button below. A 4-Panel Roll Fold has 4-panels per side for a total of 8-panels. Two panels are the same size, while panels 3 & 4 are one-eigth and one-quarter of an inch shorter in width respectively. This allows the panels to fold into each other without binding. Calculate the panels, if you know the flat size. To see how a Roll Fold folds, click the “Play/Pause” button below. A 5-Panel Roll Fold has 5-panels per side for a total of 10-panels. Two panels are the same size, while panels 3, 4 and 5 are one-eigth, one-quarter and three-eights of an inch shorter in width respectively. This allows the panels to fold into each other without binding. A 4-panel Double Parrallel Fold has 4-panels on each side for a total of 8-panels. All panel sizes are the same. To see how a Double Parallel Fold folds, click the “Play/Pause” button below. 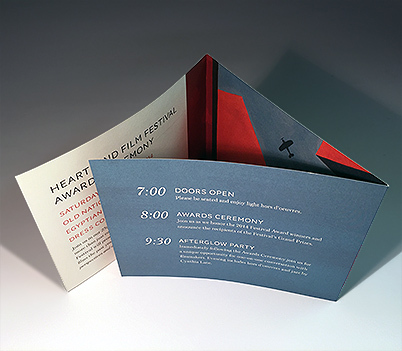 The size of a printed piece after printing and trimming but before any finishing operations that affect its size, such as folding. The trim or finish size of a piece refers to the final size of the completed piece. Text Weight Folds typically have tighter tolerances because you don't have to allow for the thickness of the paper. Cover Weight Folds take into account that the paper is thicker and so more space is figured into the folding panel size.